Welcome back. A SMS emulator is definitively a great addition to the Nspire. I'll probably give it a try later (hoping my calc issues won't prevent it from working). By the way, do you plan to update all your old ports for TI-Nspire CX CR4 if they don't work anymore? I can easily update the nSDL ports with no issues whatsoever. It is however not so easy for n2DLib... as they write diretly to the screen. This might take some time as i have a lot of games to update... including RetroGuru games. Screen is now centered and i have fixed an issue with Game Gear games. For GG games, make sure they have the ".gg.tns" extension or else the emulator will run them as Master System games. ALso there is the problem that Matref is done with calculator programming. He stopped almost a year ago and switched to PC programming ever since. Perhaps if you bugged him he wouldn't mind, though. Is n2DLib open-source? Quote Also there is the problem that Matref is done with calculator programming. He stopped almost a year ago and switched to PC programming ever since. Perhaps if you bugged him he wouldn't mind, though. Is n2DLib open-source? I thought that only applied to his nKagura game or something. I'm tired of seeing endless of abandonned projects without a single demo so i did it. 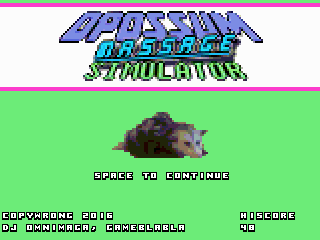 Anyway, maybe i should rename it like "Gameblabla's Opossum Massage simulator" or something. Also, juju ported it to Mac OSX and he wants to do an Android port. Well, we never know. Perhaps he no longer is interested in doing calc games, but I don't know if he meant calc stuff as a whole. It would definitively be a shame if n2DLib was dead, though. It might be a good idea to make a new topic if it is, though, to ask help on how to convert it. Perhaps some of the TI-Planet guys might be able to help, since they tend to be very open towards improving Ndless compatibility. In any case, if other versions lacks achievements it's fine, though, since achievements are not necessary. It would just make the game more funny in an update. Quote It is however not so easy for n2DLib... as they write diretly to the screen. What's that ? Never heard of it, but I can try and implement it if that makes your life easier. As for that whole thing, I'm mostly done with calculator programming as a whole, but that doesn't mean I can't maintain my existing calc projects. Of course, if n2DLib breaks because of new versions, just poke me and I'll try my best to fix it. Also, I also ported n2DLib to PC anyway, and the version I'm using for nKaruga has a lot more things in it. I might actually bring the calc version up to date with the PC version at some point (probably in a long time, when I'm done with nKaruga). I removed the URL because it was too damn long so i added you to the copyright instead. I think i will not change the name, most people will get it with some research anyways. I see you mentionned an API for that. Do you have any reference that I can take a look at ? Here it is guys, Opossum Massage Simulator for TI Nspire ! Nothing really new other than it now saves the highscore on your calc ! Also included as a bonus is a Windows version. The It RPG Is copyright is more intended as a joke actually, about how Acclaim released some of its crappier games under LJN, perhaps to avoid risks of their reputation getting tarnished by cash-grab games or to circumvent Nintendo policies at the time. Anyway this looks nice. I will have to try it later when I have a chance. Other than the highscore saving, it is not much different from the PC version you tried earlier.